UC Irvine | Zot Out Hunger! Contribute to our efforts as we push to eradicate food insecurity on our campus. Your assistance will help us provide our students with fresh, nutritious meals to contribute to their success on campus. By raising $10,000, it will help us distribute up to about 1,000 meals. During the 2017-2018 Fall Quarter, "The Swipe Squad" will be working at making food insecurity a thing of the past, by raising money to give students access to the dining commons on campus. "The Swipe Squad" is a collaboration of the ASUCI Food Security Co-Commissioners and the FRESH Basic Needs Hub team. The ASUCI Food Security Commission has a goal of eradicating food insecurity, spreading awareness, and as well as decreasing the stigma around it. The FRESH Basic Needs Hub team ensures that UCI students' basic needs are met by providing services, resources, and support. Together, we have been able to start a new initiative called Zot Out Hunger. 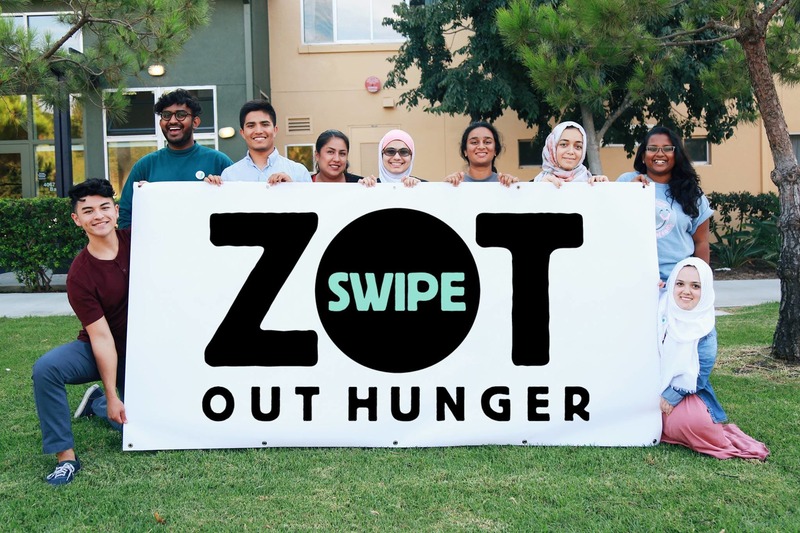 Zot Out Hunger is a project that issues swipes to students in need. 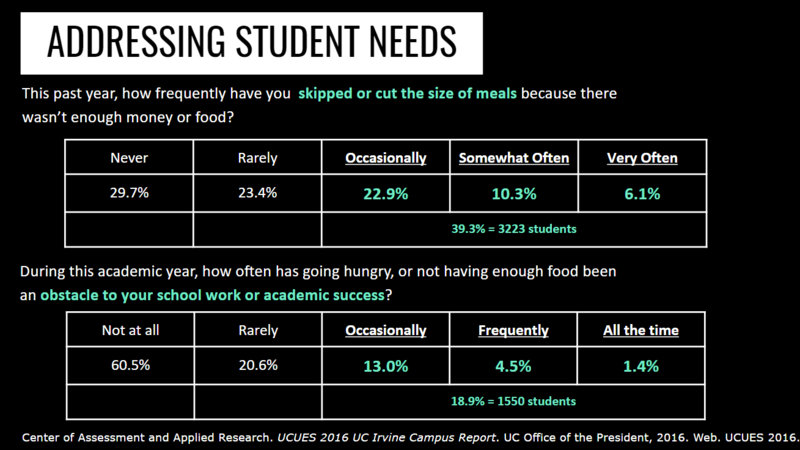 Below are last years statistics on student food insecurity solely on our campus at UCI. We want to change these statistics, so that every single student on campus can concentrate on their own student success without worrying about where their next meal is coming from. Below are testimonials that students anonymously sent in to us regarding the Emergency Meal Swipes Program. Every dollar raised from your donations will be directly funding this program. Every dollar helps. Your gift will be 100% directed to FRESH Basic Needs Hub within the Center of Educational Partnerships to Zot Out Hunger! For more questions regarding this program please contact Ernest Devin Rankin at rankine@uci.edu. Be sure to check back on our updates page to see how we are doing! Thank you so much for your support! By donating $10 to the Zot Out Hunger campaign, you will provide one student with a meal. This meal will allow students to focus on their tasks and accomplish what’s on their to-do lists so that they can be the best version of themselves! Thank you for your kind donation! By donating $30 to the Zot Out Hunger campaign, you will provide a student with 1 day's worth of meals. These meals will help a student stay focused and concentrated during their classes for the day, helping them to excel and flourish in their academics. Thank you for your kind donation! By donating $150 to the Zot Out Hunger campaign, you will provide a student with 5 days’ worth of meals. This is an incredible donation that will allow students to nourish themselves during their busy week so that they can study, engage in extracurricular activities, socialize, and thrive at their internships or leadership positions! Thank you for your generous donation! By donating $210 to the Zot Out Hunger campaign, you will provide a student with 1 week’s worth of meals. Providing a week's’ worth of meals will allow students to power through their busy school week and maximize their weekends, so that they can study for upcoming exams or work on projects with approaching deadlines with energy, grit, and determination! Thank you for your generous donation! By donating $420 to the Zot Out Hunger campaign, you will provide a student with 2 weeks’ worth of meals. At UCI, 2 weeks equates to a fifth of the quarter system. On any given two weeks, students may have 3-4 midterms, 1-2 papers due, 2-3 labs, 5 student organization meetings, and several volunteer hours. Your generous donation will provide meals for students to help them remain dedicated to their commitments, obligations, and fast-paced study schedule during these two weeks! Thank you for your very generous donation! By donating $840 to the Zot Out Hunger campaign, you will provide a student with 1 month’s worth of meals. A month is approximately half of the academic quarter at UCI, where students have usually already submitted half of their coursework for their classes. A month’s worth of meals will allow students to conquer the fast-paced quarter system at their peak so that they can begin or end the quarter on the right track. A month is instrumental in determining students’ grades and accomplishments in the quarter system, so your donation will have a significant impact. Thank you for your very generous donation!